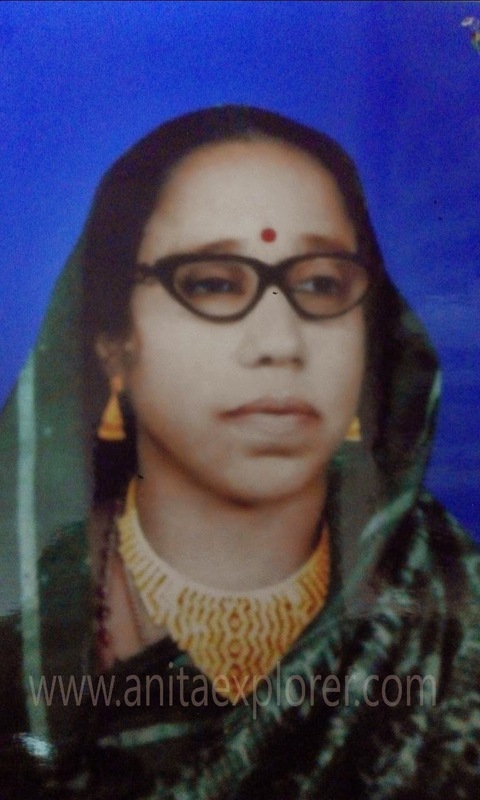 This post is a humble tribute to my Ayee, my maternal grandmother. Today is her first death anniversary. Miss you, Ayee. My Ayee was not an ordinary woman. She was always larger-than-life AND very enterprising. She was like Maa Lakshmi. She was an awesome cook. She just had to touch the cooking-pot AND the flavours AND fragrance would magically appear! All the dishes would taste divine- from simple curries AND Chuda Bhaja to rich Biryaani AND Pithas (Odia sweet-preparations). Once I had eaten multiple plates of Biryaani. (I lost count how many helpings she served me!) At another time, we were tempted & stuffed so many of her pickles! No one would go unfed from her door. She would lovingly feed everyone, even my Papa's driver or Aunt's maid! She would serve for everyone single-handedly, without ordering her four daughters-in-law to serve. I remember the Shri Jagannath Puri Temple Mahaprasad that my Ayee served us on banana-leaves. We would all sit in her giant verandah AND Ayee managed to feed us all around 30-40 members at times, AND never would there be any shortage of food.... Further, she made her daughters AND daughters-in-law AND sons AND sons-in-law all sit together with their kids, while she served! She cooked for 50-100 people at times! That time there was no gas-connection AND she used clay-chulhas with the refuse from carpentry-work. Ayee also set up a Gobar-gas connection smartly using the refuse from the umpteen cows she maintained! She managed a lot of property- fields AND their produce, tenants AND people who looked after the properties. My Ayee would never accept anything 'free'. She would always give something back. When I bought a simple cotton-saree for her out of my first salary, she handed over a lot of cash in return! When I refused to take money, she said, "You should always accept what elders give you as a blessing." I joked- "I can buy three more Sarees with this!" She planted so many fruit trees like Mango, Guava, Jackfruit, Lemon, Custard-apple AND so on, that we continue to enjoy the abundant fruits till today. She made beautiful jhoti (art patterns made on the ground during typical Odia festivities like Manabasa Gurubar) which covered entire verandah. Her favorite games were Ludo AND Snakes and Ladders, which she played with her grandchildren with utmost love AND affection. My Ayee took charge of life by being a strong pillar of support to her husband, my Aja (maternal grandfather). They were a made-for-each-other-couple. They made a choice, not a compromise AND left all the parental property behind. They started from scratch in a new city AND struck gold. She was always learning AND ready to share her experiences. My Ayee always shared stories AND lessons. My Ayee boasts of an inspirational story that defines #UseYourAnd. Thanks for reading & for your kind words, Ravish! You were lucky to have such a grandmother. You must miss her so much. My grandma passed away when I was 12, and I still miss her. Truly Kiran. We miss her so much. That's sad to learn. Really hope that may all grandchildren get the love of their grandparents. She is inspiring. It was rare in her times to make a bold time and take a stand. Those olden days were too good to last, right? Enjoyed reading your tribute. Sorry for your Ayee..Really great tribute to a wonderful woman..
Great tribute to your Ayee! Sorry for your loss Anita. Wonderful tribute. Feeling sad about your Ayee, there are only a few people out here who are so lucky who get the chance to meet their Ayee. You and I are being the one. Though you posted a nice tribute to your Ayee. Great way to give tribute Anita, she will be proud of you. People don't come back, but we relive moments in their memory. Yes MeenalSonal. 'Bas yaadein reh jaati hain'. Thanks for your kind words. Hope your words come true & wish & pray that I'll get to be at least Ayee's shadow in this birth. U are so lucky to be blessed with this soul as ur Ayi, Anita. May she rests in peace..
Hope we all get to enjoy the love and care of grandparents. Wonderful tribute to a great lady. As always you have written from the heart - a simple but wonderful homage to a generous and caring lady. I was lucky to have tasted her generosity, large heartedness and warmth. You are blessed Anita, and she is blessings you and family always from wherever she is. Loved every word of this wonderful write up. Thanks. Thanks for reading & for sharing your lovely words. I know that no matter how much we write about this warm, generous and caring lady, it's not enough. Still, made a humble attempt on her 1st death anniversary. Delighted that you liked it. Yes, her blessings are with all of us. She 's watching over us. May we all make her proud. Best wishes! A thoughtful tribute to your Grandmother, Anita. Wonderful post! Thanks a lot, Anita :) Delighted that you liked. Do spend as much time as possible with your Ayee. Enjoy the good times! I've always wondered how all Grandmas are wonderful people with big hearts and talented hands. I mean, I always thought a Grandma's goal was to ensure their kids, grand kids and all around them ate well. They've set a very high standard for the next generation of Grandma. It's really difficult to cope with the loss of a special person, who has always loved us beyond a limit. Take care! Truly Ash! You are very right! Something about their generation... We have a lot of catching up to do following their footsteps! She was brave and bundle of energy your grandma. A fitting tribute. Wonderful tribute, Anita! There was truly something very inspirational about this generation - your Ayee and mine! Yes, their generation has been inspirational. That's the feeling most of us echo, Arti! Truly Nisa :) We can only wonder at their capabilities & try to learn from them, wishing the same powers for us! In Bihari cuisine, Pithas are salty snacks. Good to know about your Ayee, Anita. Memories makes us so nostalgic ! Great that we have memories for company. Anita - I am sure she is still with you in spirits... There is something common between our grannies, no one went unfed from her home too.. god bless her .. They are watching over us. Best wishes. God bless. A wonderful Tribute!! But I'm sure you'll agree with me that what you have written about her is just "a little" of "so much more"!!! Thank you so much for reading & commenting. Wish you would share your name. Her soul rest in peace. this was a beautiful tribute, Anita. Thanks a lot, Ruchira :) Glad you liked it! I am sure she is watching over you.. my condolensces anita . Though she is not with you physically she is so with you in spirit, in values and in love. Its such a heart touching post soul-sis. We feel we as working women do so much multi tasking and are too strong but we are nothing compared to our grand mas. May she be with you always like this in fond memories. So sorry about your loss, Anita... It's an affectionate tribute for your Aayi. To live in someone's heart, is the greatest achievement in life! You look just like her, dear! Thank you so much for your wise words, Sindhu :) Ayee continues to live in our hearts & minds. She was indeed a great soul. may her soul rest in peace. Thanks for reading & for your wish, Ankita. Oh...I always wanted a grandma like her but my grandmother was different. Sorry that she is no more but her blessings always with you. Lucky are those who get to receive love from and gift love to their grandparents. Hey Anita, I think woman of that era were very strong mentally and emotionally. My Nani's character is same as you have described here. With God's bless, he has blessed us with her presence and my son is also enjoying playing with her. At the age is 80, she is taking woman younger than her for pilgrimages, holding their luggage and all. Anyone in the old city street, where she lives can ask her for money and without a hesitation, she gives it. Though she is not that rich to distribute money, but her mind is fearless of future and too much of trust in that great God. True Twinkle. Our grandmothers are so inspirational. Lovely to learn about her Nani. Thanks for sharing. Wonderful that your son has also got the opportunity to know her. Hope God gives all of us such privilege. Lovely to learn about *your* Nani. Do spend more time with her, Twinkle. This reminded me of a poem I had written for my grandma. Been four years in march, since she left us. These women were superwomen! That's great, Rinzu! Would have loved to read your poem.